Base turned the brownfield site of a derelict cinema into a new landmark mixed use building. The client asked LTS Architects to propose a striking, contemporary building that would capture the imagination of their young, professional target market. 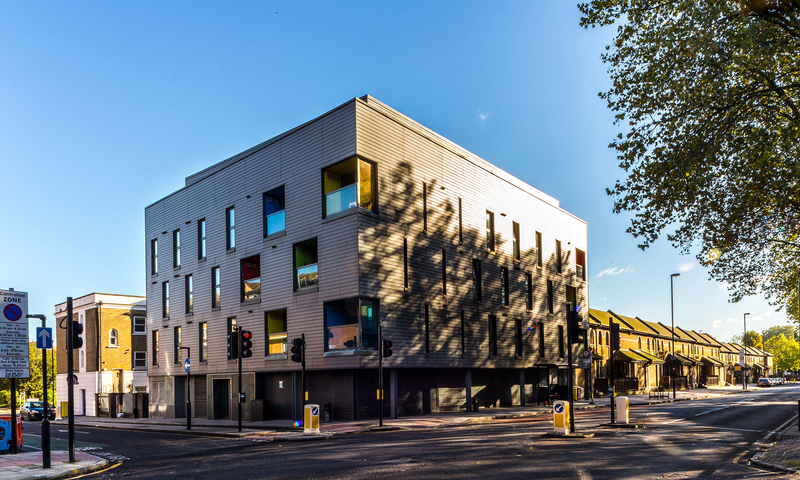 Working closely with our client we designed and delivered this contemporary mixed-use building on a corner site close to the centre of Islington. Made up of 12 two-bedroom apartments and two penthouses, the building replaces a former working men’s club and cinema with a modest single volume raised above a transparent base that houses the commercial unit. The cladding system, made from a compressed volcanic ash, forms a dark seamless coat into which windows and recessed balconies are punched. Apartments are arranged around a private raised courtyard while terraces feature bold colour pops against the anthracite exterior. The quality of design and attention to detail elevates this seemingly simple building to great heights.